Manta rays can be found typically, near tropical and temperate waters near islands and continents. Specifically continents with oceans. These rays' distribution is consired circumtropical. 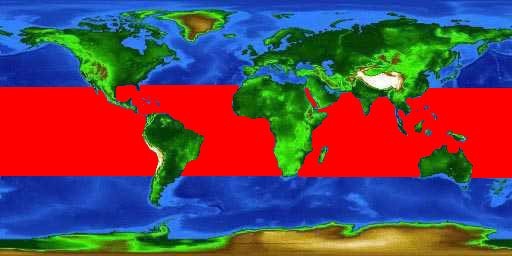 This meaning "around the world", but in a latitude sense, they can be found heavily between the 35 degrees north and 35 south latitudinal lines. Manta Rays share their habitat with organisms such as the Spinner Dolphin, and the Pacific Seahorse, and Anemones. Manta Rays are found generally near the shores of islands and continents, but occasionally they can be found over deep water, and near coral and rocky reefs. They swim by flapping their large pectoral fins and can be spotted in large numbers particularly near surge channels. Sometimes, Manta Rays have been seen interacting with seabirds, some sharks, occasionally dolphins and the other ray in their genus (the Spotted Eagle Ray, Aeto batus narinari). 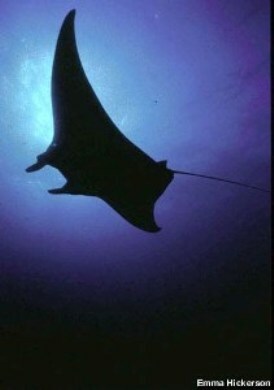 Why don't we venture on to how and what the Manta Rays consumes.